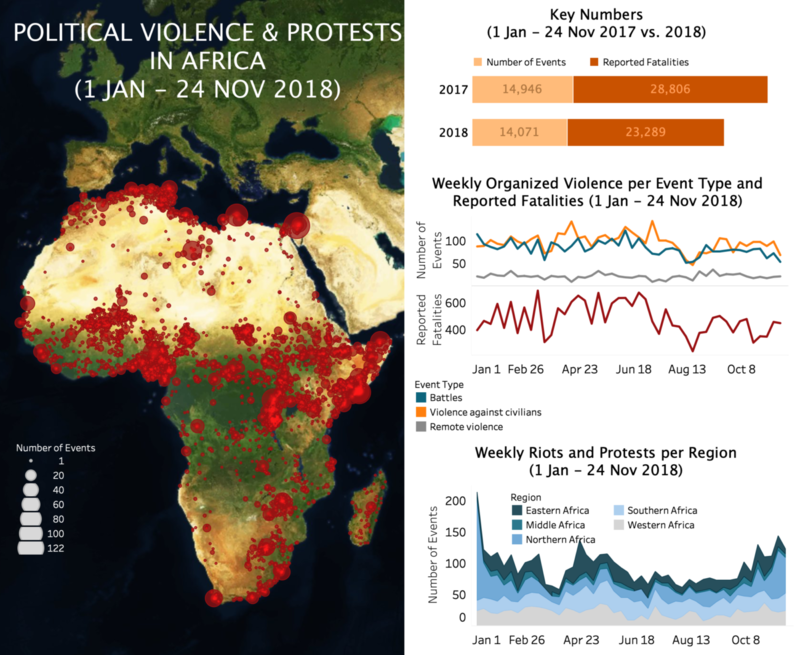 Key trends in Africa in the week of November 18th include the large campaigns launched against Islamist militants in Mali and Somalia and the high Boko Haram activity in Niger and Nigeria. Other relevant developments include the political tensions in DRC and Gabon, and the multiplication of protests in Tunisia. Large international campaigns were launched against militants in Mali and Somalia last week. In Mali, French Barkhane forces carried out a major air and ground operation against Katiba Macina militants between Farimake and Dogo (Mopti region) on November 22nd. Thirty-four militants were killed, including two senior commanders, among whom likely the JNIM Emir of the Macina Region, Amadou Kouffa. France has carried out three operations with direct engagement previously in Mopti. However, these engagements were further north, in areas which were under militant control during the 2012-2013 crisis. In Somalia, the US carried out several airstrikes against al-Shabaab in the Galkayo and Harardheere districts of Mudug region over November 19-20th. At least 43 militants were reportedly killed. In the following days, the Somali National Army launched a number of large-scale attacks against al-Shabaab in areas of Lower Shabelle, killing a reported 28 militants and recovering a modest amount of territorial control. Meanwhile, there was notable activity from Boko Haram in Niger and Nigeria. The trends highlighted last week concerning the unpredictability of the Boko Haram threat in the Lake Chad region continue. In Niger, Boko Haram militants attacked civilians in Toumour area (Diffa region), killing eight workers at a well-drilling company, and abducting at least 15 girls in several villages. In Nigeria, Islamic State (IS) -affiliated Boko Haram fighters also attacked civilians in various locations, abducting 50 IDPs in Bulakesa on November 17th. The IS faction additionally attacked Nigerian forces in Metele, killing 43, including a commander. The attack in Metele occurred 39 days after a previous attack in the same location that left at least 83 killed. On the political stage, a number of election-related incidents have begun to be reported in the Democratic Republic of Congo (DRC) ahead of the December presidential vote, whilst tensions are mounting in Gabon over a potential regime change. In DRC, three political activists were killed by unknown armed men while canvassing for the pro-government presidential candidate Emmanuel Ramazani Shadary in Kananga (Kasai-Occidental) on November 20th. The next day, police clashed with supporters of opposition leader Martin Fayulu Madidi upon his return to Kinshasa. In Gabon, the Union Nationale opposition party has asserted that Ali Bongo Ondimba’s prolonged hospitalization in Saudi Arabia as cause to denounce Jean Ping’s loss against Ondimba in the last elections. On November 23rd, the opposition held the first of a series of protests in Libreville to call for Ping’s election as the head of state. The last key development last week was the multiplication of riots and protests in Tunisia in relations to the Tunisian General Labour Union (UGTT)’s general strike call for civil servants on November 22nd. At least 41 episodes of riots and protests have so far been reported between November 18th-23rd. The strike call on November 22nd was followed at 95% participation of the country’s civil servants – 650,000 in total – causing a nationwide economic impact. The strike comes as Tunisia battles an inflationary crisis, putting the monetary demands of the strikers at odds with the austerity demands of the INF. The stability of the coalition Chahed government may be in question in light of the union’s activity. Margaux has been with ACLED since 2015 and is now a Research Co-Manager for the Africa desk. In this role, she oversees the coding of political violence and protests across all countries in Africa and analyses key trends in weekly regional overviews. She is also a PhD Candidate in Humanitarianism and Conflict Response at the University of Manchester. Her research looks at the role of civilian group actors in conflict transformation processes in intrastate armed conflicts, with a particular focus on ceasefires. More broadly, she is interested in conflict dynamics in East-central Africa as well as aspects of inclusivity and agency in peacemaking and peacebuilding initiatives.